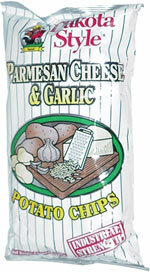 If Dakota Style had stuck to this white packaging and included different colored flavor names and drawings, it would have worked well as a range, but as it is only the logo, the stripes and the 'Industrial Strength' company slogan will be familiar to customers wondering what make the Chips are that they usually buy. This all looks a little dull and washed out. The muted pastel colors do little to promote a really good flavor. The Dakota Style claim that their Chips are 'Industrial Strength' will pop up in our reviews regularly because it is an important feature. These are undoubtedly among the thickest and crispiest Chips available. The crunch is firm. Pop a handful in your mouth and good luck with smashing them against the roof of your mouth like you can with regular Chips - they break evenly and firmly but never crumble to pieces. These Chips were light and yellowish in color with few blemishes. Many of the Chips were on the smaller side and curly with a few folded over. The 'Industrial Strength' is right - they were firm and crispy to the touch. There was little oil visible and the residue left on fingers had a light powdery feel. The Nose Plunge Test featured a mild cheesy aroma emerge from the bag. It wasn't an unpleasant feet smell either! The taste was even more impressive - a creamy cheesy, potato flavor that we couldn't quite put our finger on. It wasn't quite Parmesan but that could have just been the cotton-seed oil merging with the garlic powder to create what was a really good flavor.